For the suburb in Buckinghamshire, see Hazlemere. For the surname, see Haselmere (surname). Haslemere (/ˈheɪzəlmɪər/) is a town in the borough of Waverley in Surrey, England. 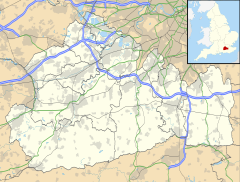 It is north-east of the tripoint with Hampshire and West Sussex, approximately 12 miles (19 km) southwest of Guildford, and is the most southerly town in Surrey. The town is in the upper Wey (south branch) valley and east of the A3, the major road between London and Portsmouth. The town's railway station is served by South Western Railway, with services between London Waterloo and Portsmouth, and there is a small commercial district with service and retail amenities. The south branch of the River Wey rises to the south of the town, on Blackdown, West Sussex. The earliest record of Haslemere was in 1221 as a Godalming tithing. The name describes hazel trees standing beside a mere (lake). The lake does not exist today, but there is a natural spring in West Street which could have provided its source. High Street is a watershed with water from the west going to the North Sea via the Wey whilst water from the eastern side goes to the English Channel via the River Arun. In the 14th century Haste Hill, also called East Hill, was the main settlement at Haslemere and there may have been a church as there were references on the site to "Churchliten field" and the "Old church-yard" of Haslemere Haslemere was granted a charter by Richard II in 1394. This right was confirmed by a new charter issued by Elizabeth I in 1596. Today, this special status is celebrated with the Charter fair, held once every two years in the High Street. There is a bust of Elizabeth I in Charter Walk, linking West Street with the car park alongside Waitrose. The town was one of the rotten boroughs, returning two Members of Parliament until the Reform Act of 1832: one was Carew Raleigh the son of Sir Walter Raleigh. Haslemere's borough expanded into the surrounding Haslemere parish and recovered with the construction of the Portsmouth Direct Line, which connected Haslemere with London Waterloo and Portsmouth Harbour railway stations. In Victorian Britain Haslemere became a fashionable place to live and continues to be a commuter town for London, and to a lesser extent Portsmouth, served by Haslemere railway station. During the building of the railway, the first of the two murders of Surrey Police Officers occurred in Haslemere High Street on the night of 28/29 July 1855, when Inspector William Donaldson was beaten to death by drunken navvies, which brought the darkest hour in the history of Haslemere. The only other murder of a Surrey Police officer was in Caterham in 1974. St Bartholomew's Church was originally a chapel of ease for Chiddingfold, and probably dates from no earlier than the 16th century. Apart from the base of the tower, and some of the north wall, the original church was demolished in July 1870. The new church was consecrated on 28 July 1871 by Bishop Wilberforce. The church contains memorials to many of the most prominent local residents, including Alfred Lord Tennyson, who lived south of Haslemere at Aldworth House and is commemorated in one of the stained glass windows, featuring Sir Galahad and the Holy Grail. Haslemere is a town in the borough of Waverley, Surrey, England, close to the border with both Hampshire and West Sussex and is the most southerly town in Surrey. The major road between London and Portsmouth, the A3 climbs and enters a tunnel to the west and a source of the River Wey to the south. Haslemere is 11.9 miles (19.2 km) southwest-by-south of Guildford. surrounded by hills, with Blackdown at 920 feet (280 m) to the south and Gibbet Hill at 894 feet (272 m) to the north. The latter was the site of state executions from at least medieval times until the late 18th century. Many of those hanged were highwaymen, because the roads around Haslemere, particularly alongside the nearby Devil's Punch Bowl, were notoriously dangerous. Today, much of the heathland and woodland is owned and protected by the National Trust and has become a popular attraction for walkers. Haslemere marks the western end of the Greensand Way footpath which extends for 110 miles (180 km) to Hamstreet in Kent via the high Greensand Ridge, and is one end of the short Serpent Trail which connects to the Sussex Border Path. Elevations range between, in fully developed roads, 205m AOD to 97m and 112m AOD alongside respectively the east and west streams which forms an east-west steep valley through the parish almost meeting in the town centre. This lowest point is specifically in the north east, where one headwater gently curves north following the line of the railway past the north of Grayswood, however rapidly descends another 40m in the space of a few miles. This east stream is the longest headwater of the River Arun/ˈærʊn/ then passing the north of Chiddingfold and turning south close to in the village centre of Dunsfold. By contrast the west stream, the River Wey south branch flows around Headley and past Frensham Common, joins the north branch in the centre of Tilford and heads towards Guildford before reaching the River Thames. However across the north and the south, the wooded hillsides reach 272m at Gibbet Hill in the north[n 1] and 204m, [n 2] AOD 211m on Marley Common south of Camelsdale and 280 on Black Down rising gradually across the county line in West Sussex. The soil is particularly unusual, though common in southwest Surrey, the Bordon area of Hampshire and bottom of the upper vale of Midhurst, being "freely draining very acid sandy and loamy soil" that forms 1% of English soil, of low fertility; its natural vegetation includes acid grasses, pines and coniferous trees; further examples include Blackheath, Surrey and Blackheath, London. ; to the east of Haslemere is the more naturally fertile "slowly permeable seasonally wet slightly acid but base-rich loamy and clayey soil" that here forms the western start of the Low Weald soil that continues as far as Maidstone, Kent. Grayswood is a small village to the northeast of Haslemere and 3.5 miles (5.6 km) southwest of Witley. In 1894, Alfred Hugh Harman moved to Grayswood and in 1900 he offered to finance a church in Grayswood on land given by Lord Derby, on condition that a parish was created. The new ecclesiastical parish of Grayswood was formed from parts of the parishes of Witley, Chiddingfold, Haslemere and Thursley in 1901. Shottermill is a parish and village 1 mile (1.6 km) to the west of the town. Shotters mill, after which the area is named and Shottermill Ponds are in West Sussex, the mill being a few yards south of the Wey which forms the county boundary. The mill was driven by piped water from the ponds. Wey Hill is a busy shop-lined street linking the railway station to Shottermill. Wey Hill took its name from the old mill at the head of the south branch of the Wey which rises in Haslemere; this area includes 5,769 of Haslemere's 15,612 residents (2001). Novelist George Eliot had a cottage, Brookbank, on what was Shottermill Common, where she wrote most of Middlemarch. Woolmer Hill to the west is a half developed, half wooded hill, which includes The Edge sports centre with sports ground and Woolmer Hill School which is state-sponsored. Ten buildings in the village are listed, as well as two on the hillslopes around the hammer ponds in the hamlet known as Critchmere. One of the latter is the Grade II* listed Branksome Place. Dated 1901 over its entrance, it was designed by E J May but has Edwardian additions. It has enormous classroom wings in Glass Reinforced Polyester by James Stirling connected by a corridor at the rear. It was used as an hotel and conference centre until 2012. The modern parts mark a shift in Stirling's career away from the heavy, Brutalist brick aesthetic of his early work to a more classically-inspired post-modern tradition which is international in flavour; here he developed the use of GRP as a sophisticated building material, and this is the first "major building by a major architect to be built in GRP in Britain". The principal spaces are richly designed, and survive virtually unaltered. Extension rooms have a nautical theme as it was previously a naval college. There are other minor areas of settlement to the south. Shepherd's Hill is the name belonging to the neighbourhood to the south of the town centre, which is accessed by three short roads, Shepherd's, College and Museum Hill. The area has large gardens and four listed buildings Broad Dene at Grade II*, features a round tower with conical roof and spike. It was built in 1900 for Walter Tyndale by William Frederick Unsworth, see Shakespeare Memorial Theatre; his business partner was Inigo Triggs. Substantial and sensitive masonry makes up the house, carefully recalling medieval solidity and enclosure. This hillside community nestles among the woods leading to Hindhead and consists of approximately forty houses of which three are listed buildings. Its High Street is wide because of its use as a cattle market before the 1920s and characterises the heart of Haslemere, with the Town Hall standing at its southern end. The White Horse and The Swan Inn are the two public houses along the main street. Along the High Street, West Street and Charter Walk are a mix of shops (mostly independent), restaurants, cafes, banks and estate agents. In 2009 a Waitrose opened in the town centre replacing the previous Somerfield supermarket. To the west of the High Street, separated from it by the railway station, is an area known as Wey Hill. Here, there is a bank and a public house, shops (again, mostly independent), restaurants and takeaways. The town library is in Wey Hill and so are two further supermarkets, a Tesco and a Marks and Spencer. The Grade II-listed Georgian Hotel, operating as an hotel since the 1920s, but dating from the 18th century, stands in the High Street. Local news is provided weekly by the Haslemere Herald (established 1896), published by the Tindle Newspaper Group in Farnham. Haslemere has a concert hall known as The Haslemere Hall. On Bridge Road, just off West Street, the hall can seat 340 people and is used regularly as a theatre, a concert venue and a cinema. Performances are held by local theatre groups including the Haslemere Thespians and the Haslemere Players. Haslemere Musical Society Symphony Orchestra and Chorus, conducted by James Ross, also hold performances and there are popular music concerts. Films are shown shortly after their general release. The town is significant musically, partly through the contribution of one family. Arnold Dolmetsch, musician and instrument maker, was born in France in 1858. The family settled in Haslemere his son, Carl Dolmetsch, taking over the business. They revived the recorder and began the revival of other instruments of early music, contemporarily with the start of historically informed performance which itself came to fruition towards the end of the 20th century. The family firm still manufacture viols, recorders and harpsichords. Their presence inspired the International Dolmetsch Early Music Festival held every year in the town. Haslemere Town Band was officially founded in 1837 following the amalgamation of two small bands which had started in 1834, and is one of the UK’s oldest brass bands in continuous existence. Their first engagement was playing for the coronation of Queen Victoria in 1838. The Band continues to play an active part in the life of the town, playing at community events throughout the year, as well as at numerous summer fetes and garden parties in the surrounding district. They have also performed in the twinning towns of Bernay in France and Horb am Neckar in Germany. In 1397 Richard II and the Bishop of Salisbury confirmed an order dated 29 April 1221 allowing an annual fair to be held in the town. The first ever recorded fair was held in 1394. Haslemere has a mixture of State and Independent schools at all levels. The town is served by four state primary schools - St Barthomew's Church of England (Aided) Primary School, Shottermill Junior School, Camelsdale Primary School and Grayswood Church of England (Aided) Primary School. The only state secondary school is Woolmer Hill School, which is an academy. The Royal School is the only boarding school of the three private schools in Haslemere, the others being Haslemere Preparatory School and St Ives. St Ives School, founded in 1911, is an independent school for girls and boys. There was a fourth private school, Wispers, which closed in 2008. Haslemere Educational Museum is at the northern end of the High Street. It was established by eminent surgeon Sir Jonathan Hutchinson in 1888 to provide educational opportunities to local people, and moved to its present location in 1926 – a house with a Georgian façade, but partly dating back to the 16th century. The museum has extensive grounds, a permanent natural history collection including an observation beehive, and hosts talks from both local and national figures of interest. For much of the 20th century Hutchinson's granddaughter Margaret took an active interest in the museum. In 2012 the museum won the Telegraph Family Friendly Award. The museum celebrated its 125th anniversary in 2013. Haslemere has a religious institute, described as "Institute of Modern Languages and Theology" and known as Jamia Ahmadiyya. This college is one of the many religious universities (jamias) owned by Ahmadiyya Jamaat, inaugurated in October 2012 Between Haslemere and Hindhead, the listed building was a country house built in 1901 by E. J. May for Charles McLaren, 1st Baron Aberconway, originally called Hilders, then Branksome Hilders, and later Branksome Place when it was a training centre for Olivetti; after Olivetti, it was run by De Vere as a hotel. Haslemere railway station is operated and served by South Western Railway. It is on the Portsmouth Direct Line with trains running between London Waterloo and either Portsmouth Harbour or Portsmouth and Southsea. Haslemere is served by buses to Aldershot, Guildford, Hindhead, Bordon and Midhurst. The A286 and the A287 are the main routes into Haslemere, with the A3 running close by. Two cricket clubs are Haslemere and Grayswood. Haslemere has a Non-League football club Shottermill & Haslemere F.C. who play at Woolmer Hill Sports Ground. The Haslemere Leisure Centre, on King's Road, owned by Waverley Borough Council, replaced the swimming pool previously at Lion Green in the 1990s (now the site of Tesco). Facilities include a swimming pool, fitness suite, squash courts, children's play area and creche, and an aerobics studio. Woolmer Hill has a sports centre, the Edge, owned by Waverley, which includes gym facilities for disabled people; the sports ground has a clubhouse that is home to a number of local teams; facilities include four rugby pitches, two football pitches, and two artificial hockey pitches. The senior Haslemere RFC team plays in the Surrey Leagues. The Town Council elects a Town Mayor for a term of one year. Arnold Dolmetsch (1858–1940), a French-born musician and instrument maker who spent much of his working life in England, established an instrument-making workshop in Haslemere. Arthur Conan Doyle (1859–1930), the creator of Sherlock Holmes, lived in a house called Grayswood Beeches in the latter half of 1896. At the beginning of 1897 he moved to nearby Hindhead. Neil Drysdale, US-based thoroughbred horse trainer, was born in Haslemere in 1947. Cyril Edward Gourley VC MM (1893-1982) lived in Grayswood from 1952 until his death. Axel Haig (1835–1921), architect and illustrator of the Victorian Gothic Revival, lived and worked in Haslemere from the 1890s until his death. He had a house built for himself, Grayshurst, and designed All Saints' parish church, Grayswood. Margaret Massey Hutchinson (1904-1997), teacher, naturalist and author, granddaughter of Sir Jonathan, lived and worked in Haslemere. General James Oglethorpe (1696–1785), who founded the Colony of Georgia in British North America, was Member of Parliament for Haslemere 1722–54. John Penfold (1828–1909) lived at what was then called Courts Hill House. He was a surveyor, architect, and in 1866 designed a standard pillar box for the General Post Office. Rachel Portman, a composer best known for film music, was born in Haslemere in 1960. James Cholmeley Russell (1841–1912), a barrister, financier, property developer and railway entrepreneur, lived at The Woodlands, Merrow and latterly Longdene House, Haslemere, where he died on 29 August 1912. Alfred, Lord Tennyson (1809–92) lived and worked at Aldworth House, Haslemere, for much of his later life, dying there in 1892. Tennyson spent much of his time walking around Blackdown in Haslemere and famously sat at the Temple of The Winds in Blackdown. John Tyndall (1820–93) retired to Haslemere in 1885 and is buried in St Bartholemew's parish church, Haslemere. He was an eminent physicist, mountaineer and science educator, and first established the radiative properties of various greenhouse gases. Sir Robert Hunter, KCB (27 October 1844 – 6 November 1913) was a solicitor, civil servant and co-founder of the National Trust. Hunter was appointed CB in 1909 and promoted to KCB in 1911 for his services to the Post Office. He retired at the end of July 1913, and died at the age of 69 of toxaemia less than four months later at his house at Meadfields Hanger, Haslemere, Surrey. He is buried in an unmarked grave at St Bartholomew’s Church, Haslemere. Haslemere is twinned with Bernay in France and Horb am Neckar in Germany. The average level of accommodation in the region composed of detached houses was 28 per cent, the average that was apartments was 22.6 per cent. The proportion of households in the civil parish who owned their home outright compares to the regional average of 35.1 per cent. The proportion who owned their home with a loan compares to the regional average of 32.5 per cent. The remaining percentage is made up of rented dwellings (plus a negligible percentage of households living rent-free). There are more than 100 listed buildings in Haslemere. ^ a b c d e H.E. Malden (1911). A History of the County of Surrey: Volume 3. pp. 45–49. Retrieved 1 March 2012. ^ "Surrey Constabulary". open.ac.uk. Retrieved 11 May 2016. ^ "Hero policeman killed by mob". 29 July 2005 – via news.bbc.co.uk. ^ Katherine, Jessel (2007). St Bartholomew's Parish Church, Haslemere. A short History, 1180 to the present day. Haslemere, Surrey, UK: The Friends of the Parish of Haslemere. p. 18. ^ a b c England, Historic. "Search the List – Find listed buildings - Historic England". list.english-heritage.org.uk. ^ a b "Soilscapes soil types viewer - National Soil Resources Institute. Cranfield University". www.landis.org.uk. ^ Middlemarch/Brookbank on the north side of Liphook Road nos 24-6 Grade II listing: Historic England. "Details from listed building database (1244178)". National Heritage List for England. Retrieved 15 November 2012. ^ "Home – Places for People Leisure". www.dcleisurecentres.co.uk. ^ "Welcome to Woolmer Hill School". www.woolmerhill.surrey.sch.uk. ^ a b Branksome Conference Centre Grade II* listing: Historic England. "Details from listed building database (1244332)". National Heritage List for England. Retrieved 15 November 2012. ^ Broad Dene Grade II* listing: Historic England. "Details from listed building database (1244326)". National Heritage List for England. Retrieved 15 November 2012. ^ "Georgian Hotel planning boutique makeover". Haslemere Herald. 29 March 2018. Retrieved 7 November 2018. ^ "British Newspapers Online: Haslemere Herald". Retrieved 14 March 2014. ^ "Haslemere Musical Society". Retrieved 24 October 2018. ^ "Find My School - Haslemere". Retrieved 30 June 2018. ^ Hannah Blackburn (3 January 2012). "Schools by location". Surrey County Council. Retrieved 1 March 2012. ^ "Independent Private Schools in Haslemere". Independent Schools Council. Retrieved 1 March 2012. ^ "Shock closure of award-winning school". Midhurst and Petworth Observer. 6 May 2008. Retrieved 21 May 2011. ^ Museum, Haslemere Educational. "Haslemere Educational Museum". www.haslemeremuseum.co.uk. ^ Heal, Sharon (1 June 2012). "Haslemere Education Museum wins family award". Museums Journal. Retrieved 30 June 2018. ^ "Haslemere Museum: 125th Anniversary". Retrieved 16 January 2014. ^ "New Jamia Ahmadiyya UK Building Inaugurated". Press release. Ahmadiyya Muslim Jamaat International. 1 November 2012. Retrieved 2 December 2013. ^ "British Listed Buildings: Branksome Conference centre". Retrieved 18 November 2014. ^ "Station facilities for Haslemere". National Rail Enquiries. Retrieved 1 March 2012. ^ "Commuter Guide - Haslemere". Retrieved 1 March 2012. ^ Nicholas Ross (25 January 2012). "Godalming and Haslemere bus timetables". Surrey County Council. Retrieved 1 March 2012. ^ Aldershot & Guildford (Map). 1 : 50,000. Landranger 186. Ordnance Survey. 2003. ISBN 0-319-22815-0. ^ "Location - Shottermill & Haslemere FC". Pitchero.com. Archived from the original on 31 January 2013. Retrieved 22 January 2013. ^ "Surrey County Council Information: Haslemere Leisure Centre". Retrieved 7 November 2018. ^ "Surrey County Council Information: The Edge Leisure Centre". Retrieved 7 November 2018. ^ "Drysdale Name Meaning, Family History, Family Crest & Coats of Arms". HouseOfNames. ^ Gliddon, Gerald (2004). VCs of the First World War: Cambrai 1917. Sutton Publishing. ISBN 0750934093. ^ "Haslemere & District Twinning Association". Haslemere and District Twinning Association. 26 March 2013. Retrieved 20 May 2013. ^ "Listed Buildings in Haslemere". Retrieved 2 March 2014. Wikisource has the text of the 1911 Encyclopædia Britannica article Haslemere. This page was last edited on 3 March 2019, at 21:03 (UTC).